Gas Cylinder Storage (LPG) – Safety, Security and Convenience. Although there are various ways to store gas cylinders, or gas bottles (propane and butane), this article focusses on enclosed storage, used predominantly by mobile / static home parks, catering outlets and general industrial use. The storage of LPG gas cylinders within an external housing (to prevent theft, tampering or simply for aesthetic reasons) – raises a number of significant and key considerations. Gardening shows on TV are as popular as ever, the main runners, such as Gardeners World, Love Your Garden and The Great British Garden Revival are still blooming, and new shoots, such as the The Instant Gardener have proved that the public are still greatly interested in watching and learning how to maintain, design and create more interesting gardens. In this episode Bernard the Dragon employs the services of two dopey trolls to steal Sir Tristan’s shed. Pretending to be maintenance men their plan soon backfires as they do not realise that the shed requires no upkeep and is guaranteed for 25 years. It therefore does not take long for the castle residents to see through the evil plan and the trolls are rumbled. A few years in the dark, damp dungeon awaits them; but maybe they would prefer that to reporting their failure back to Bernard. In the cold winter months, your fire or log burner will require a ready supply of quality, dry (seasoned) logs to work effectively. In this article we consider the best options for storing your logs outside in a practical, convenient and safe way that will keep them dry all winter long. Seasoned logs are traditionally stacked neatly, close to (not touching) a wall or fence, it is important to be quite precise as tight stacking will ensure that only the top layer will get damp if it rains. With winter just round the corner it is a good time to make sure that both it, and its contents, are prepared. Hopefully the following hints and tips will help you. Ensure that you have treated your shed with a good quality wood preserver or paint. Check for any loose woodwork, especially around the roof and replace or repair as necessary. Ensure the roofing felt is sound, free of tears and well attached; if not then high winds will just rip this off. 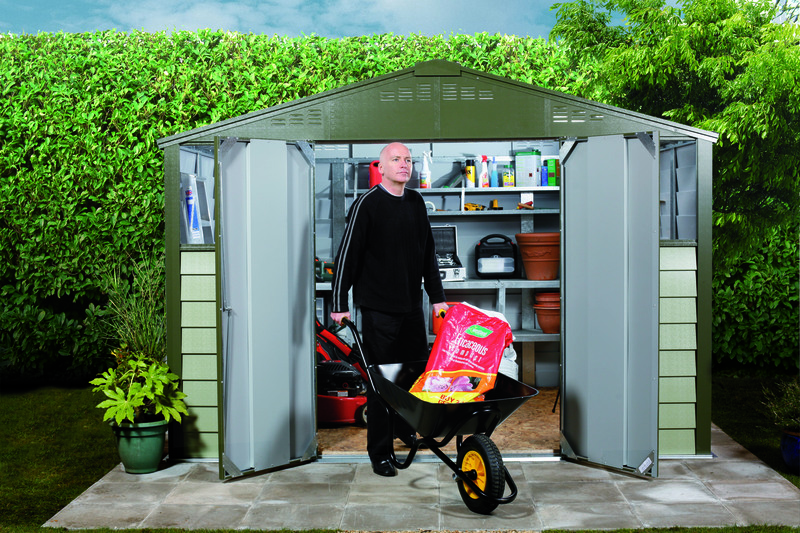 Check for any cracks or holes and use a good quality wood filler to rectify, this will keep your shed dry and also deter any unwanted visitors, such as mice or rats, making your shed their winter home. If you have any windows, check the seal around them and repair with exterior silicone sealant if required. Remove any leaves and twigs from gutters. Oil hinges and any locks including padlocks. 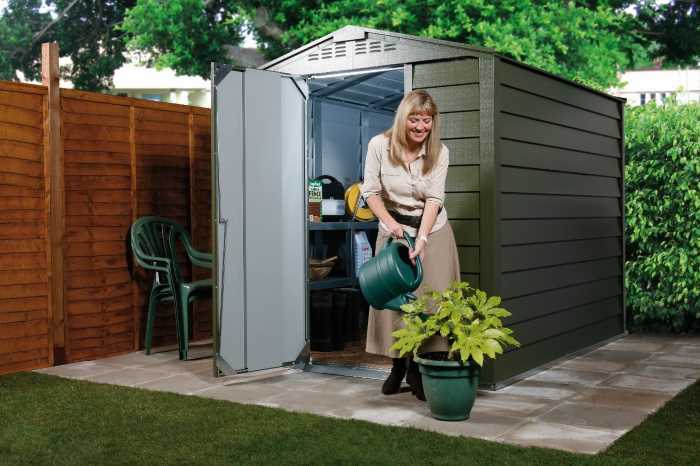 Most premium metal sheds are maintenance free so require no treatment but a quick wash down with mild warm soapy water will remove any dirt. Check the tightness of fixings, especially on the roof, as these can rattle loose on cheaper sheds – you will find more expensive sheds use locking nuts that will prevent this. Ensure gutters are clear from twigs and leaves. Lubricate hinges, locking mechanisms and padlocks. Winter is an ideal time to have a shed sort out and discard any items you do not require anymore. 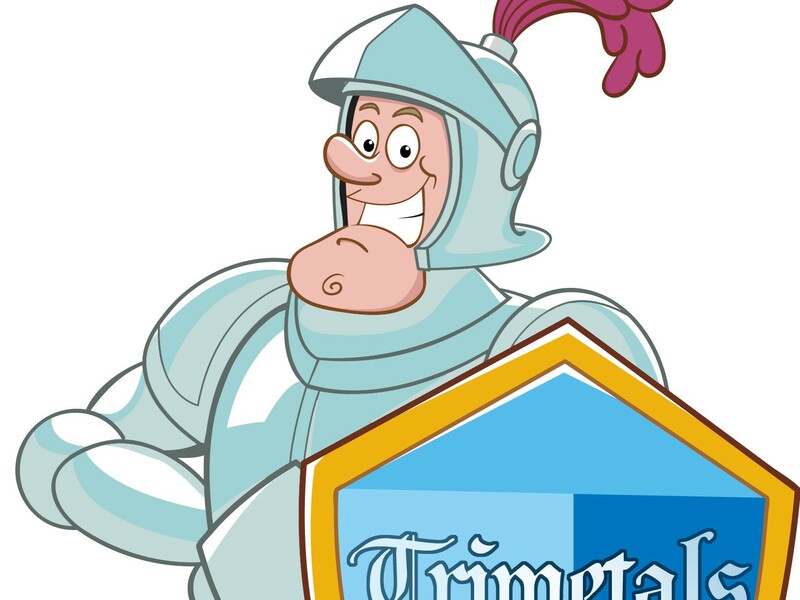 Although the modern day Trimetals was founded in 1967 it now appears that our medieval ancestors also had ideas about metal sheds. Recent excavation work in the tunnels under the Trimetals factory have revealed ancient manuscripts, now translated they tell the story of chivalry, heroism, dragons and, of course, metal sheds. Unless you brave all weathers over the winter and autumn on your cycle it’s now time to get it out of storage and ready to ride. Whilst fairly straightforward to check over yourself it is always sensible to get a local cycle shop to give it a once over if you are still unsure about anything. With spring just around the corner, there is a wealth of jobs waiting for you in the garden but could some be minimised or even avoided all together so you are free to focus on the things you find more enjoyable about bringing your outdoor space back to its former glory after the gloomy winter months? Who Can You Trust When it Comes to Online Reviews? When you wish to know more about a company’s products or service level it is common to go straight to the internet. Whilst we trust professional independent companies such as Which? we also spend considerable time reading past customer reviews. However, it’s now thought over 25% of online reviews are fake and indeed some companies even offer incentives to their customers to leave positive reviews; so how can you be confident that you’re buying the right product from a reliable source? 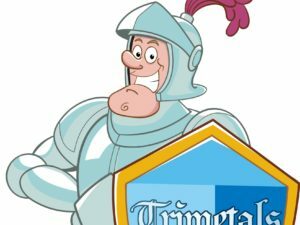 December has seen a ‘right royal’ celebration of Trimetals winning the Queen’s Awards for Enterprise. 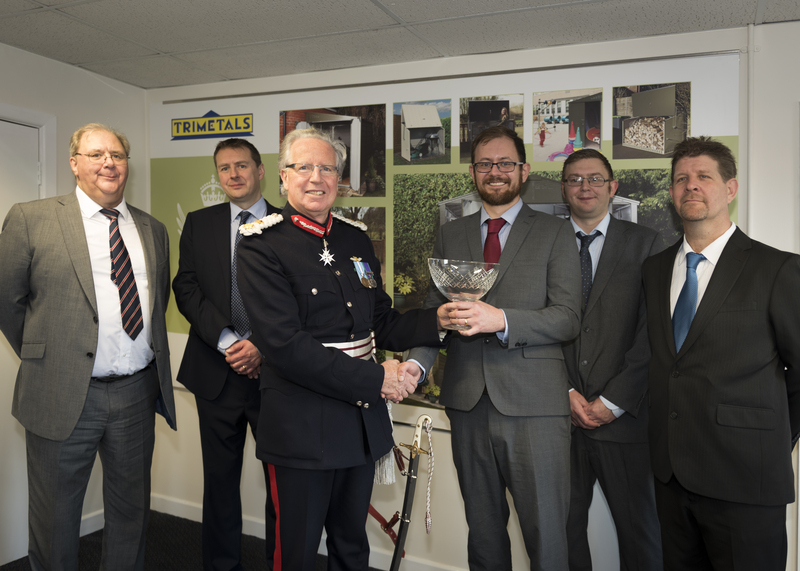 Following the announcement of the prestigious award earlier this year, Her Majesty’s Lord-Lieutenant of Dorset, Angus Campbell, has recently visited Trimetals Limited to make a formal presentation in recognition of the company’s significant and sustained growth in global markets. 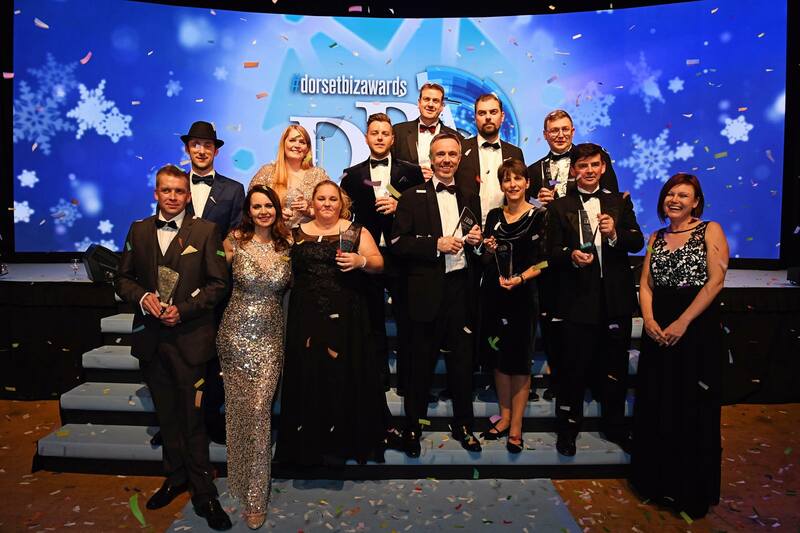 Pictured; all 11 winners at the Dorset Business Awards 2016 and Debra Stevenson. Trimetals are delighted to have been named winner of the Family Business Award at the Dorset Business Awards 2016. With Autumn already here and Winter closing in by the day it is time to seriously consider how to protect and store your garden furniture over the approaching dark cold and wet months. Maybe you have purchased a nice new table and chairs for the patio this season complete with parasol, a further skip full of garden toys for the children or that new barbecue that you simply had to have. Bicycles are great; fun to ride whilst keeping you fit and healthy, all in the great outdoors – what’s not to like? Well nothing really but unfortunately you cannot be cycling all the time unless you are Bradley Wiggins, but even he probably stops for a quick cup of tea and a sandwich every now and then. So the problem of bicycle storage then arises, where to put your precious bike when it’s not being used, and like cycles themselves there are many options available at all price points. It’s that time of year again where it’s time to start planning for the winter. So, after a long, wet winter last year, it’s more important than ever to get stocked up and make sure you have enough logs to take you through winter.